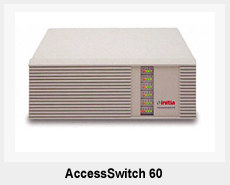 The AccessSwitch (ISDN access switch) combines audio, data and video over a single Primary Rate ISDN or T1 circuit and directs traffic over the most cost effective route to the public network. Flexible and scalable, the AccessSwitch products are designed to help business and government (large or small), take full advantage of the benefits of video conferencing and advanced digital communications. At TKO, we offer training, technical support, diagnostic assistance and one of the largest inventories (worldwide) of upgrades and replacement parts for these products. Contact us for further information and availability. 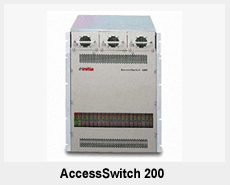 AccessSwitch designed for branch office sites, endpoints or individual floors of large buildings. 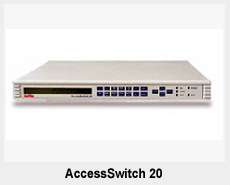 This is an appliance switching system with all the capabilities of the larger switches in a preconfigured 1RU height. 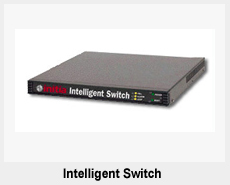 Quiet and small, this switch can be configured to connect video conferencing systems, telephone systems or routers to BRI lines, PRI lines, T1 lines or all three. This platform is often used to distribute high cost network access from a telephone company to several locations in a regional or small office. ISDN Q.931 diagnostic tools are available to assist technicians in resolving even the most challenging Telco related problems. An extension of the Model 20 AccessSwitch this is a 1RU switch that can connect to multiple networks simultaneously. Basic Rate ISDN, Primary Rate ISDN and T1 signaling are all supported. Additionally, V.35 with RS366 or RS449 interfaces enable connection to routers and video systems. This low cost platform is ideal to distribute and convert T1 or PRI network access from a telephone company to BRI service at several locations in a regional or small office. ISDN Q.931 diagnostic tools and call trace capabilities are also built into this switching platform. This is an expandable switching platform. The base unit is configured with 4-T1/PRI interfaces on the system controller. There are 5 available slots for other cards/modules including PRI cards for distribution of Primary Rate ISDN, BRI cards for distribution of Basic Rate ISDN in either the U or S/T interfaces (2 or 4 wire). There are also cards that allow connection to routers and video systems using V.35 with RS366 or RS449 interfaces. All of these cards combine with the power of the switching system software to allow network translations and call processing from endpoint to endpoint over nearly any network type. AccessWare Software Software that enables control, management and provisioning of your AccessSwitch. Included with each AccessSwitch is local connection software that allows for a PC to be connected directly to the switch. This software can perform call trace analysis and it offers snapshots of active calls on the switch for easy network analysis. Another version of the software is also available to manage entire networks. The interface is identical to the local management software version but it enables an operator to remotely dial into or IP into multiple switches for easy remote configuration and management. Individual plug-in modules that can be inserted in either the AccessSwitch 60 (6 slot) or AccessSwitch 200 (20 slot) Frame. The modules include the OBIU, OBIU-U, MCU4, SAIU, BRIU, PRIU, VTIU, INP, INP4, INP4D, INP4/4T, QDIU, QEIU, QDIU-EX, DDIU-EX, DEIU-EX, SEIU-EX, QRVX and DRVX. See related page for a description of each card/module type or call TKO at 1.800.216.3476 for technical assistance. TKO delivers same day URGENT SERVICE to AccessSwitch Equipment as well as other video communications equipment and networks in select metro areas of the United States. We also provide next day service throughout much of the developed world. These services are designed to offer Mission Critical support to your video or communications network. Contact us at 1.800.216.3476 for further information about training and technical support. TKO Video Communications is an industry leader in providing reliable, high-quality video communications solutions for business, government, education and global enterprises. Services include video conferencing, video and audio streaming, satellite broadcasting and event management. Founded in 1995, TKO is based in San Jose, California with offices in New York City, Washington DC, San Diego, Singapore and Ireland. Offices: San Jose | New York City | San Diego | Washington, D.C.